Training managers have the responsibility of ensuring that all employees have the skills, and knowledge, to perform their job roles effectively. Many training managers are under time and budget constraints, but yet have to come up with innovative training programs that can be scaled rapidly. 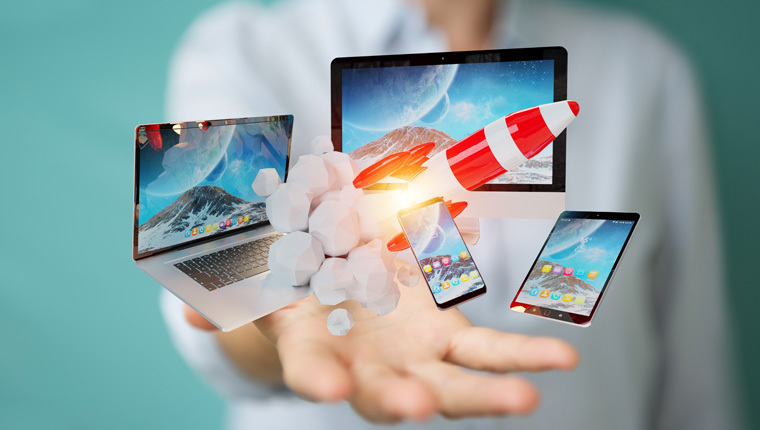 With the extensive use of rapid authoring tools, rapid eLearning development has been successful in addressing these challenges faced by training managers. Here’s a scenario for you to consider. Brian is the training manager of a multinational company. He is assigned the task of converting the existing classroom training program on compliance policies to a rapid eLearning course. Here are the requirements that his online training program needs to meet. Though there is quite a lot of content to cover, the online course needs to be rolled out quickly. Employees in diverse geographical locations need to be trained. The training program needs to be accessible to learners on-the-go. Brian knows that the best way to meet these requirements would be to go for rapid eLearning development, as the training program needs to be rolled out quickly. Mobile learning is the solution for learners on-the-go. Translation of courses is required as learners are in different geographical locations. After careful thought, he decides to go in for Lectora Inspire as the rapid authoring tool of choice. Why did he choose Lectora? This scenario forms the basis for understanding the role of Lectora in rapid eLearning development. Read on to know more about this rapid authoring tool. Even after content is chunked appropriately, there might be instances where learners have to scroll the screen to view the content. Lectora allows you to customize the interface, so that you can display the content on a single screen, without a vertical scroll. Training managers who are looking at rolling out mobile learning courses, can benefit from using Lectora. The responsive course design (RCD) feature was introduced in Lectora 16, and it gets better with the tool’s latest version, Lectora 17. Lectora offers a timesaving solution, when it comes to rapid eLearning development for mobile learners. Here’s how it does so. The Auto-Play feature allows audio and video files included in the eLearning course to be automatically played on mobile devices. Anchor Position is a feature that can be used to fix the position of certain elements in the mobile learning course. For example, the position of objects like company logo, course navigation controls, videos, and images can be fixed even while learners scroll through the course. RCD allows you to design courses for the desktop, and then rescale objects for optimal viewing on mobile devices. You design the course once, and enable distribution on multiple devices. Whether learners use an Android, an iPhone, or an iPad, your rapid eLearning course is going to play seamlessly across all devices. Imagine the time it would take, if you had to achieve all these effects with programming, or with the use of add-in tools. The responsive bar in Lectora lets you preview how your course is going to appear on different mobile devices. In the scenario that we looked at earlier, the training manager had to roll out the rapid eLearning course in multiple languages. Lectora is one of the best authoring tools that can be used in rapid eLearning development for a global workforce. Lectora simplifies the task of translating online training programs. The content of the course developed using Lectora can be exported to an rtf file that can be sent to the translation service provider. The translated content can be imported and published to create the translated course. By choosing Lectora as the rapid authoring tool, it is possible to create a multilingual interface. Let learners select the language in which they would like to view the course. It is possible for learners to switch languages even in the middle of the course. Do not dump information on learners with uninspiring click-and-read courses. Instead, capitalize on Lectora’s features that allow you to create an engaging learning experience. When you invest in the Lectora Suite, you gain access to in-built templates, characters, and interactivities that offer an enriching learning experience. The Lectora Template Library comes with templates for games, scenarios, interactivities, course starters, and navigation players. The Cutout People Library has more than 50,000 characters, to which emotions and poses can be added. Since the characters come with transparent backgrounds, there is no time wasted in clipping images. All you need to do is drag and drop them in the selected background template. You can also customize templates if required. If you have to train employees on content-heavy subjects such as compliance policies, you need to ensure that the courses are not plain and boring. Include realistic scenarios, so that learners can relate to the content. In-built quiz templates can be used to create effective assessments. Lectora not only offers an engaging experience, but also saves time and money in rapid eLearning development. Lectora is a tool that’s powerful, yet simple enough to be used by L&D professionals to create successful rapid eLearning courses. Rapid eLearning development with Lectora can address the requirements of training managers, as its multitude of features are all that you need to create amazing online training programs. If you have used Lectora for rapid eLearning development, do share your thoughts on the role this tool had to play in creating cost-effective, high-quality, online training programs.